Sometimes you can’t see the wood for the trees, the saying goes, and sometimes you miss out on the spectacular skyline when you’re standing in the urban forest of towering edifices that make up Dubai’s downtown area. 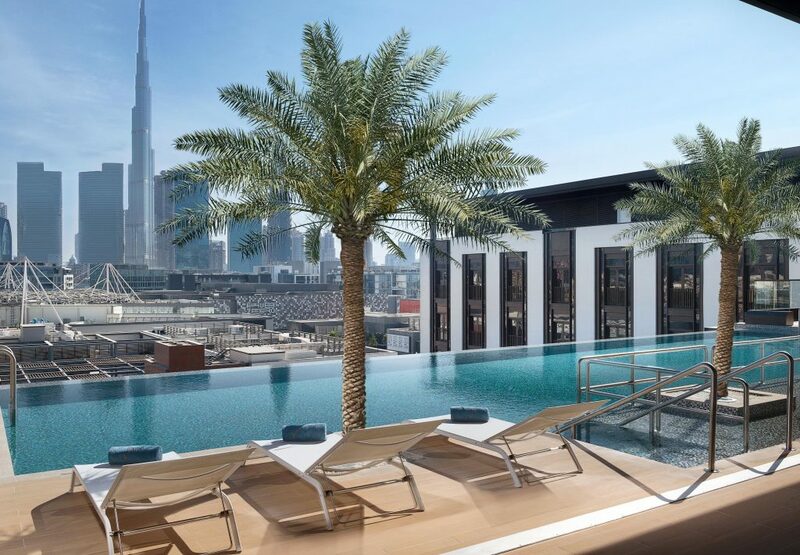 Fortunately, just ten minutes drive from downtown, the Marriott group have recently opened the boutique La Ville Hotels and Suites CITY WALK as part of their exclusive Autograph Collection and, from this idyllic outpost, one can look on the impressive architecture of Dubai without becoming submerged within it. Not everyone has yet discovered this gem within Dubai, but it is bound to become increasingly popular as tourists become aware of its existence. As the first hotel within the area, La Ville Hotels and Suites CITY WALK is perfectly placed for shopaholics, families and those just wanting to have a little more sky in their morning view. The high-end City Walk retail complex in which the hotel is located provides luxury boutiques, cinemas and dining destinations literally on the doorstep. 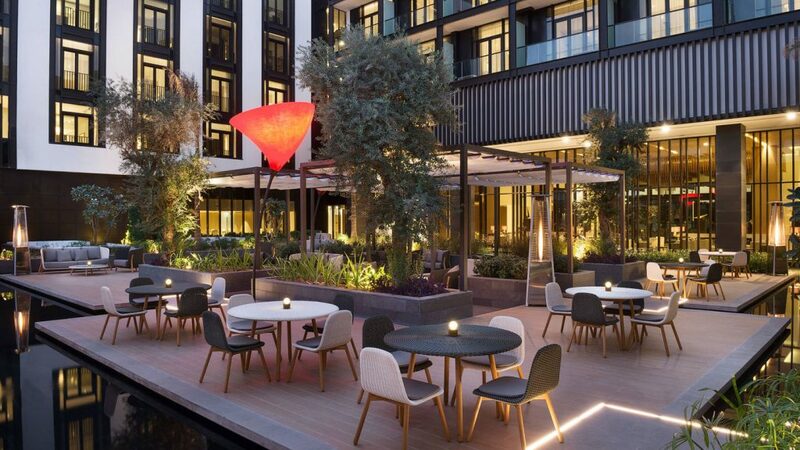 The hotel’s own Grapeskin Bar is a destination for locals and tourists alike, with colourful lighting and cocktails, while the rooftop infinity pool allows guests to enjoy a refreshing dip while gazing across City Walk towards the imposing towers of downtown, including the epic Burj Khalifa. With your own car, or by using Uber and taxis, is it very easy to get to all the central locations that a tourist must visit on a Dubai trip. The Jumeirah Mosque, in particular, is a great experience to seek out from this location, although visiting non-Muslims should join the daily tour if they wish to enter and hear about Islamic culture in Dubai. Another must-see is the world’s tallest building, the Burj Khalifa, where one can visit the observation deck on the 148th floor (booking recommended). It’s worth buying a priority ticket, which allows you to join a group that jumps the endless queues and has a lounge in which to enjoy some snacks, but even if you do choose to line up, the view is incredible and it won’t be often that you have the opportunity to stand this far from the ground. The interiors at La Ville Hotels and Suites CITY WALK are contemporary and spacious, with neutral beige, cream and sandy tones creating a cool, relaxing welcome. White flowers are stacked high in vases while statement sculptures drip from the ceiling. Staff are cheerful and friendly, immediately making one feel at ease. Our room had full windows to allow in copious sunlight and it felt like a serene haven from the bustle of the city. 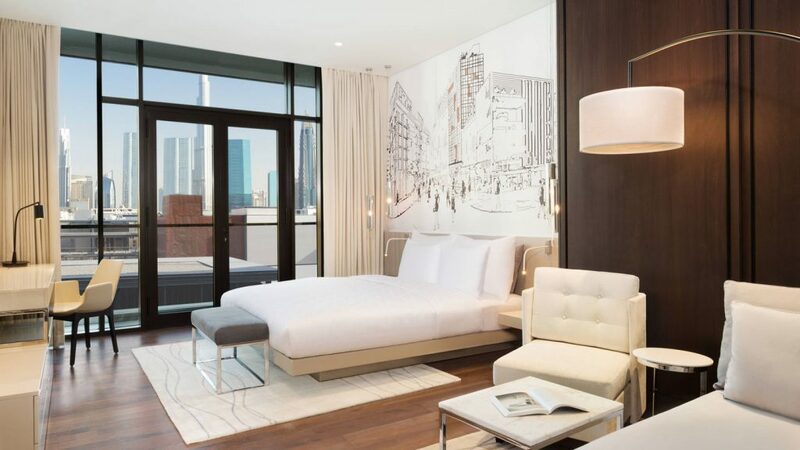 Pen and ink designs featuring the glamorous streets of City Walk adorn the wall above the bed and there is more than ample storage space to hide your luggage so the pristine ambience of the room might be preserved. The beds were the most comfortable of all those that we stayed in in Dubai, and we had no need to ask for firmer pillows, a criticism which can often be levelled at luxury hotels (who seem intent on smothering guests with giant marshmallows while they sleep). After a long flight, the room was a blissful space in which to relax and recuperate, and it did a similar sterling job of reviving us after the following night at the Cavalli Club. All the usual facilities are available, including 24 hour room service, international cable TV on a large flatscreen and – most importantly – an air-con system that is easy to control and unobtrusive enough to keep on all night. 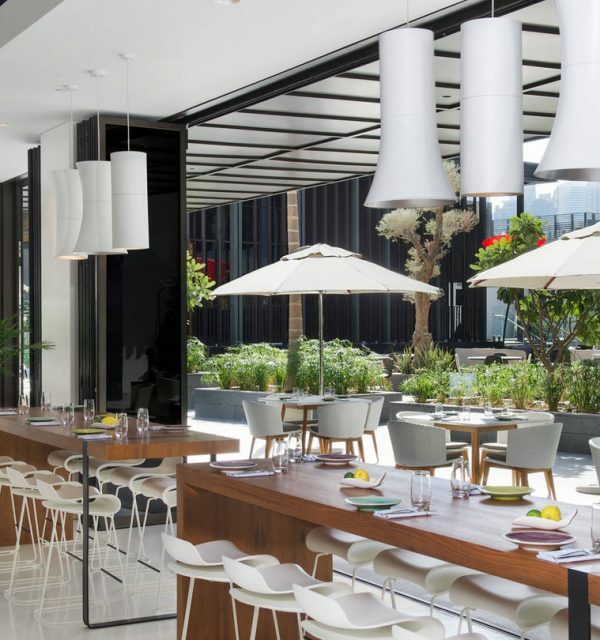 As well as a gym, spa and complimentary parking, the hotel also has a number of food and beverage options, including GRAZE Gastro Grill, the LOOKUP rooftop bar and a 24 hour café in the lobby. Finally, there is Chival, a chic yet informal dining destination that serves global cuisine for breakfast, lunch and dinner. 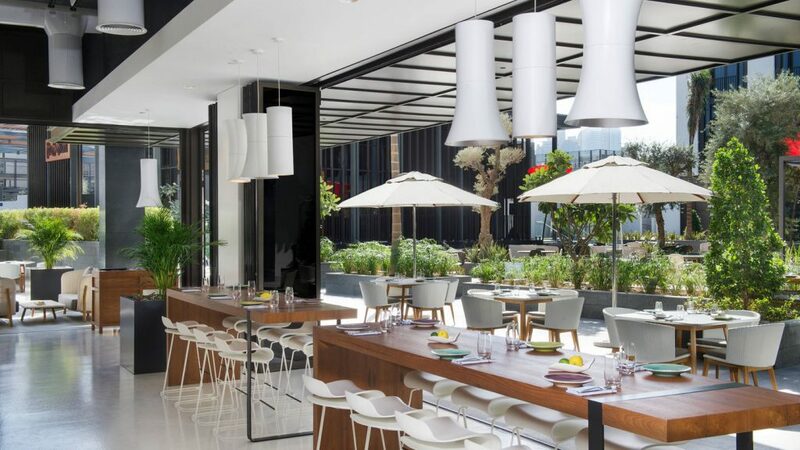 If one lived in Dubai this would be a great place for lunch with your friends, as well as a casual dinner before heading to the City Walk cinema. We tried the menu at lunchtime and were not disappointed. A range of Arabic flavours form one part of the menu, while other fusion and healthy light meals and snacks take their inspiration from a range of cuisines. We began our meal with juicy kibbeh meatballs and cheese sambousek pasties, alongside a glass of Pinot Noir bubbles by Jacobs Creek. Continuing with the Arabic theme, I chose Sheikh el Makshi, a beef-stuffed aubergine dish, while Charlotte chose the more Asian flavoured salmon with mandarin maple glaze and courgette noodles. Both dishes were well cooked and moreish, but we made sure that we left enough room for the coconut ice cream being sold along the pedestrian area of City Walk. 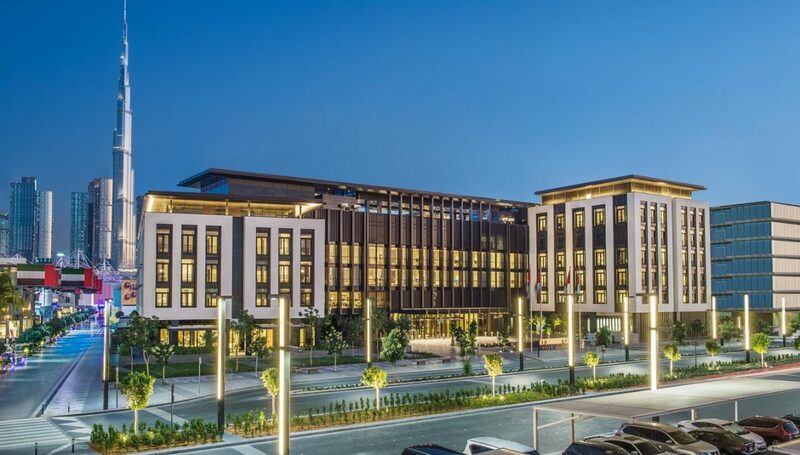 La Ville Hotels and Suites CITY WALK may not immediately be on your radar as a good base for your exploration of the Dubai area, but its proximity to most of the key sights, as well as the benefits of the City Walk lifestyle destination make it a location you should definitely consider. 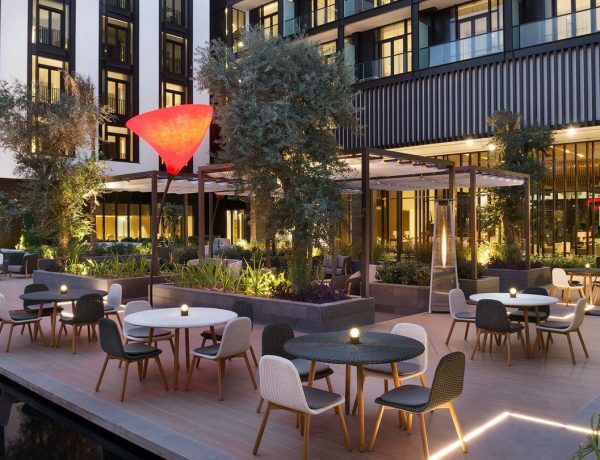 An oasis just outside the bustle and heat of Dubai’s downtown, La Ville Hotels and Suites CITY WALK offers something unique and on the up, a place so much the best of all worlds that you’ll rave about when you get home. Unless of course you would rather keep this secret to yourself. It’s between you and me. Shhh.